-Early registration for the Summer Reading Quest. 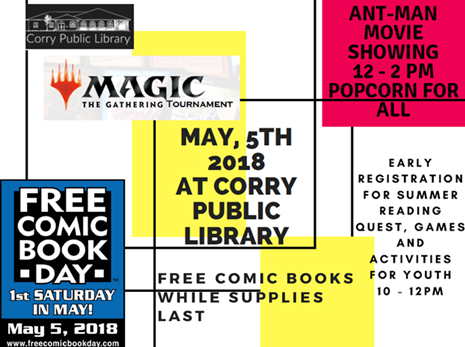 Children who preregister May 5th through May 31st will be entered in to win a special prize.The first 4 teens and the first 4 adults to register on May 5th will get to pick a small gift. – Ant-Man movie showing. Popcorn for all attendees. This movie is rated PG-13. Attendees must be 13 and up or have parental permission.